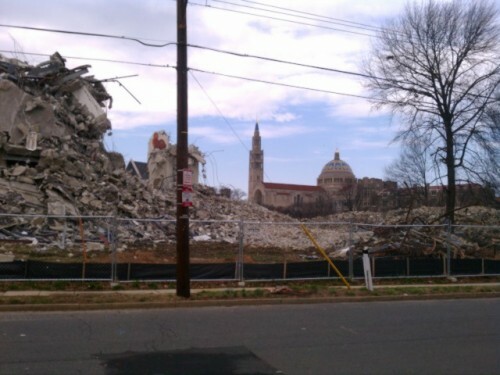 I was wondering if you have noticed the demolition of the old CUA dorm buildings taking place on the corner of 7th and Monroe St. NE? Do you or any of your readers happen to know what is going on there? The multi-phase Catholic University South Campus redevelopment will be located on five city blocks in Washington, D.C.’s Brookland neighborhood, adjacent to the Brookland Metro station and just three miles north of the U.S. Capitol. The community will ultimately consist of a progressive mix of uses: approximately 720 residential units, 45 townhomes, 83,000 square feet of street-level retail, 15,000 square feet of artist studio space, a 3,000 square-foot community arts center, and 850 parking spaces. Approved plans also include streetscape and hardscape improvements which will greatly improve the South Campus’s walkability, creating a lively, pedestrian-friendly atmosphere and significantly improving traffic patterns and pedestrian crossings along Michigan Avenue. It expects to be completed in 2013.